The Chief Electoral Officer, Uttar Pradesh (CEOUP) has started an SMS based program to identify booth level officer information and polling station details. 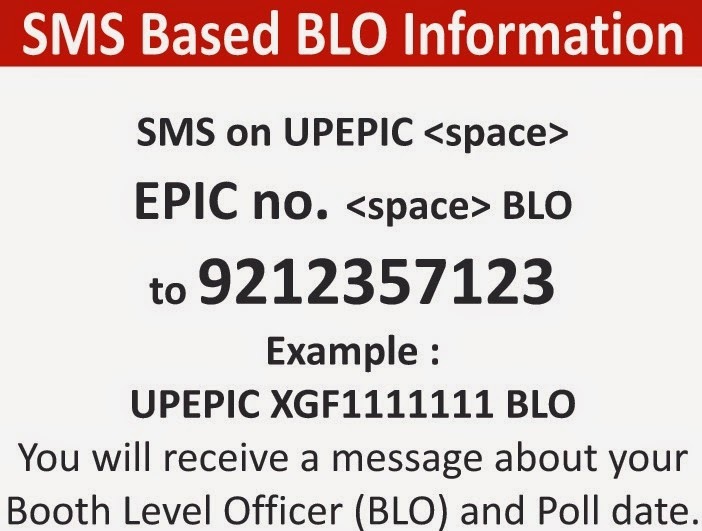 Registered voters have to send an SMS from their mobile phone to find who is their BLO and their Polling Station Name, Date of Poll. Voter have send SMS to 9212357123 to avail this service in the following manner. Voter have to Type UPEPIC then space, then they have to enter their EPIC No. (Electronic Photo Identification Number), then space then they have to type BLO as shown above. They need to send this SMS to 9212357123. After sending they will receive their BLO information and polling booth information also on to their mobile phone.